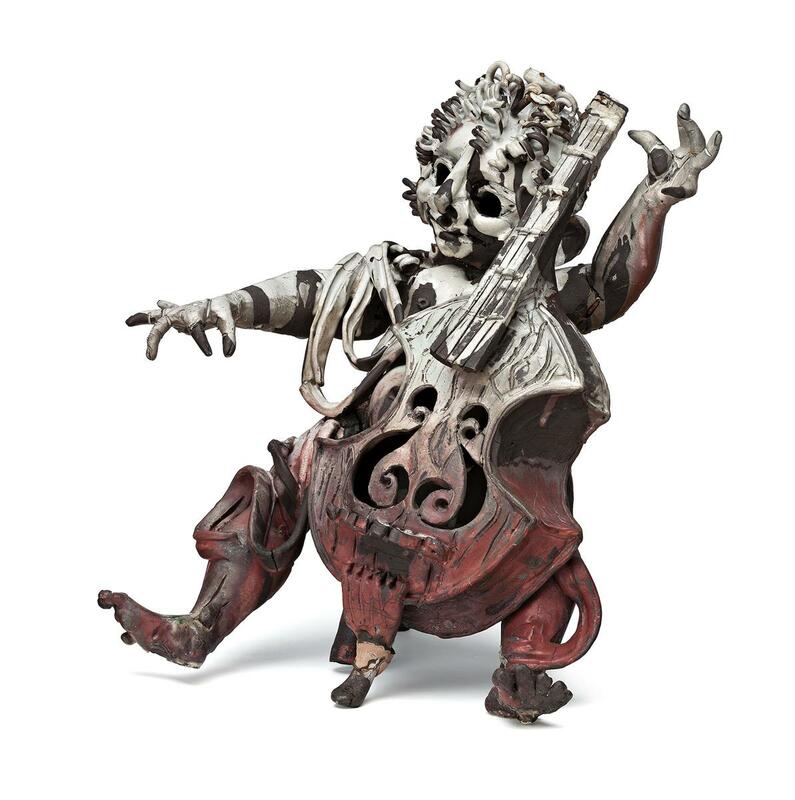 Angel with Cello, 1957, earthenware with copper oxide glaze, 30.3 cm height, in the collection of the National Gallery of Australia, Canberra. John Perceval’s ceramic Angels are highly sought-after items whenever they appear on the market. Such was the impact of their first exhibition in 1958 at John Reed’s Museum of Modern Art that Bernard Smith pronounced it to be ‘one of the most important one-man shows held in Australia since the war … (which) revealed him as an artist with an observant eye and keen wit.’1 Apart from displaying a compelling and mischievous spirit, the Angels are also marvellous examples of technical skill and prowess, reflective of the previous decade Perceval spent in partnership with his brother-in-law Arthur Boyd at their Murrumbeena business, AMB Pottery. Whilst earlier examples tended to lack fine detail, pieces from the second series (of which Cello Player, c.1958–59 is one) feature finely articulated fingers and delicately curled hair. A photo of Perceval and his children from 1958 shows one work in progress ‘balanced atop three small balls of clay, which were subsequently removed before firing … The hair, according to his then wife Mary, was spun (around chopsticks) by the artist like fine Chinese noodles.’2 The richly coloured glaze is worth noting too, the result of the artist’s pursuit of an elusive ancient Chinese recipe known as sang-de-boeuf, a green glaze that turns red and gold as the heat within the kiln is lowered. Many of the Angels series are now held in the collections of the National Gallery of Australia, National Gallery of Victoria, and the State galleries of South Australia, New South Wales and Western Australia; and as prized items within important corporate and private collections. As a result, few appear on the open market with only eight examples appearing since 2000. The most recent of these was Acrobat Angel, c.1958 from The Gould Collection, which sold for $97,600 through Deutscher and Hackett in March 2017. Many thanks to Helen Brack for her assistance with this essay.